Cytological research is used in oncology for tumor detection, in hematology – for diagnostics of illnesses and assessment of their treatment effectiveness; in gynecology – with the aim of diagnostics of oncological illnesses and hormonal disorders; for detection of many illnesses of respiratory, digestion, urinary organs, nervous system, etc. Valery Ivanovich Klyuchnikov works as doctor-cytologist in National Medical Surgery Center in the name of N. I. Pirogov. “Mainly I conduct research with the help of microscopy of cytological smears, imprints, scrapings, and the material received with the help of biopsy and puncture”, tells Valery Ivanovich, providing part of the results of his everyday work. “I get micrographs using trinocular Micromed-1, camera Altami USB 3150 R6 1/2 CMOS (3 Mpix) and Altami Studio 2.0.0 application, with the help of which it is very convenient to conduct measurements of elements”. At the picture 1 there is a micrograph of glandular epithelium from the cervical channel. Glandular cells are encircled elliptical shapes. “Cytological examinations of the cervical canal are conducted for prophylaxis of precancer and cancer of vesical cervix. At this micrograph it is possible to see normal glandular epithelium from the cervix, but I think that it is the example of a badly colored smear. It is impossible to make any conclusions on its basis because of the presence of artifacts. Artifacts here are unconsolidated accumulations of paint (paint defects smear). These are interfering objects and they distort the general picture of analysis”, explains Valery Ivanovich. Examination of a proliferative type of the smear is shown at the picture 2. The smear was taken from the outer surface of the vesical cervix and from the cervical canal. “Here we can see outer cells of the multilayer squamosal (scaly) epithelium with small nuclei, and accumulations of glandular epithelium cells from cervical canal as glandular structure (stripe) with large hyperchromatic (thick) nuclei. 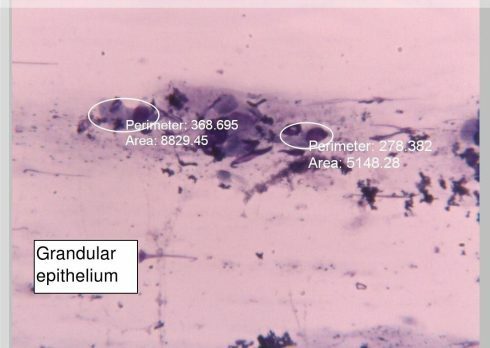 In Altami Studio application a diameter of such nucleus was measured, and its size equaled to 11.46 mkm”, comments Klychnikov V. I.
Micrograph at the picture 3 with the image of proliferative type smear from the outer surface of the vesical cervix. “This is the normal smear of the woman of child-bearing (procreative) age. In the first phase of the cycle it is characterized by the abundance of mature surface cells of multilayer squamosal epithelium. In other cases this type of the smear can be a sign of pathology. At the microphoto there are squamous epithelium cells with small nuclei, and there is rod microflora”, tells Valery Ivanovich, doctor-cytologist. Microscopy examination of the proliferative type smear allows to diagnose viral nature of vesical cervix pathology (picture 4). “In this micrograph I can see normal vaginal rod microflora, yet I can also see swelling of nuclei of separate cells with forming near-nuclear zone of enlightenment (koylotsitoz). It speaks of the defeat of the epithelial cells infected papillomavirus infection”, – notes Klyuchnikov V. I. At the picture 5 there is a micrograph of a smear from an outer surface of the vesical cervix of a woman in menopause condition. “Here I can diagnose an acute infection, to be precise, atrophic colpitis (vaginitis). It is possible to make this conclusion because of redundant accumulation of leukocytes and enlargement of cells nuclei. In Altami Studio application a diameter of randomly chosen nucleus at the micrograph was measured. The diameter was equal to 14.71 microns”, answers our respondent. Atrophic colpitis is a complex of symptoms the reason of which is a substantial decreasing of estrogens content, and which leads to thinning of multilayer squamous epithelium. “Cytological research is one the basic methods of objective diagnosing of atrophic colpitis”, claims Valery Ivanovich. Besides gynaecological examinations, Valery Ivanovich conducts diagnosing of thyroid nodes (Picture 6). “At this microphoto we can observe normal cells of thyroid gland epithelium in the mass of insoluble colloid (bodied mucoid substance) produced by them. In the taken smear vacuolation, a type cell dystrophy, the characteristic of which is forming of vacuoles in cytoplasm, is present. This tells on different abnormalities in cells metabolism, in their functions and structures”, tells Valery Ivanovich. Colloid goiter of thyroid is an illness developing as the result of iodine deficiency. For prophylaxis in order to prevent forming nodules it is enough to consume iodine and vitamins. “Also I examine smears made from punctate. Punctate is a small amount of fabric or liquid extracted with the help of puncture with a thin needle. At the next micrography recorded punctate study of thyroid nodules (Picture 7). In this case it consists of monomorphic (preserving one form during the whole development period) small thyroid cells of А type in small accumulations. There is a trend to forming microfollicular structures (stripes, rosettes), thus, there is a possibility of adenoma. Monomorphic adenoma is, simply speaking, a single, solid node deep in the gland. One should not be afraid of the diagnosis, because thyroid of adenoma is a benign tumor and it rarely turns into malignant”. “I use Goryayev’s camera in order to count blood element and determine their concentration and mobility (Picture 8). It is calibrate in Altami Studio application. With the help of Goryayev’s camera it is convenient for me to determine the magnification. I use it only as calibrator”. “Cytology is a complicated science and subjective. That is why doctor-cytologist should have not only the respective qualification, but also a great experience of work in cytological sphere”, Valery Ivanovich says. “We need cytological research for diagnosing of different conditions of vesical cervix, for examining thyroid tumors and other prophylaxis examinations. Nowadays cytological examinations which have received recognition and are widely spread reach great success in making the people healthier”, thinks doctor-cytologist Valery Ivanovich Klyuchnikov.